Yesterday, I presented at the AIS 2016 Annual Conference. It was the first time I have presented using an autoethnography of a blog – so it was more of a performance of a blog than a paper presentation. Doing the presentation really helped me think about how I want to present the blog chapters in my dissertation. The presentation takes advantage of the feature images to help add a level of depth to the text that is being read. It does feel kind of weird reading aloud a genre that is really meant to be read silently, rather than presented. That being said, I really felt like it could be a screenplay – I also think it would be really cool if I had other people read the blog comments – rather than me reading both. Displaying the feature images on the big screen has an impact on the story being told. I find that I want to show the pictures of the people leaving comments with their names, to help emphasize that there are real people behind the blog comments. That it isn’t fiction. One of the challenges with this type of writing is that it never seems done. I feel like I constantly need to make tweaks to the text. In this case, you can tell that I was running out of steam towards the end of the presentation. I ran out of time for additional edits. I don’t feel like this work is done, rather it is a working draft. I welcome feedback and comments on how I might improve it. As I do the rewriting of the text, I remind myself of the words of Art Bochner in Evocative Autoethnography – “Show don’t tell”. With that, I am trying to rewrite the interactions with people as dialogue. I am keeping my internal thoughts as tell text, as I am telling what is running through my mind. But I’m changing all of the telling that involves interactions with others into dialogue – which makes it more appealing to read and increases the impact of the story. I’m also working on the filtering out of parts that are not relevant to the story. Some of the tangential thoughts are important, but others are just extra. One of the challenges that I’m facing is dealing with my mis-understandings and incorrect information in the blog. There were times when I wrote things that I thought were correct at the time, but two years later I understand a lot more about the disease. I struggle with whether or not I should keep the incorrect information in the re-publication – in part because it was what I believed to be true at the time I wrote it. I welcome suggestions on how this could be handled? Perhaps I need to write it as I thought it at the time, but footnote it so that I it is clear that what I wrote is not technically correct? What do you think? I also have a chapter that I’ve written that I’m not quite willing to read aloud. I’m willing to publish it as text, but I am overly challenged by the idea of describing details of my breast self-examinations in a read-aloud format. I actually feel kind of awkward sharing it with my committee, but I know that it adds depth to the story. I also think it is an important thing to tell, as it can help others identify concerning symptoms sooner. Robin DeRosa (@actualham) did such a great job tweeting my presentation that I just had to include here tweets here. Thanks Robin. Now @rjhogue quoting @Bali_Maha's response to her cancer blog– a lovely and poetic moment in an already poetic presentation at #aiscon16. "Why should insurance determine treatment options?" Canadian @rjhogue processes cultural differences in cancer paths in her #aiscon16 paper. 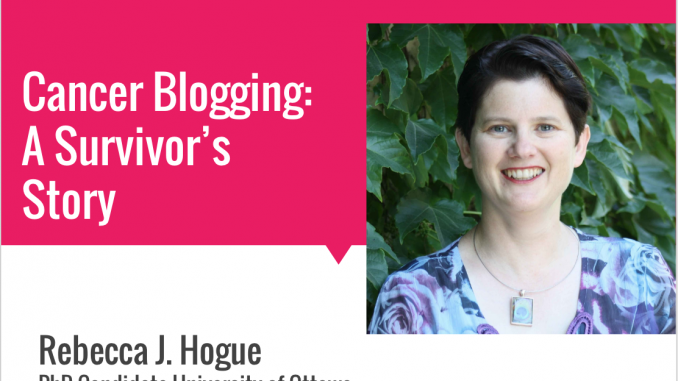 How cancer impedes and enhances @rjhogue's work as an educator, part of her reflection during her #aiscon16 paper. A quick note. I don’t think my doctors know how to hear me and reading blogs may give them practice in what it “sounds like” to “see a patient” rather than complete just another appointment. Thanks for the intro to your presentation. Will go over it ASAP. As for comments made at the time that may be “inaccurate”, it seems vital to convey to medical practitioners that the clarity of what they told you, often when you are in crisis, might not have been clear at all. My sense is that being a patient and being a worker in the medical field are two separate realities that fit only in the imaginary world of those who have never been ill.